I'm glad to see that I'm not the only one who thinks it would be cool to upgrade the car with more powerfull motor, battery and speed controller. I was also pretty surprised to see that when the car has all four wheels firmly on the ground it feels pretty close to how my stampede and rustler handles. 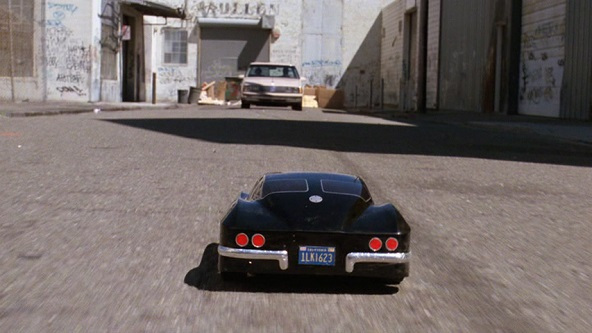 It's more twitchy for sure, but still surprisingly accurate for a rc car in gta. I mean it does go 60 miles/hour that already seems pretty fast for a heavily armored RC car that can tank rockets. But I would like to see motor upgrades to take this up to 80 mph. 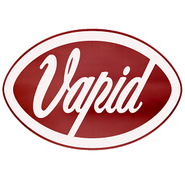 There are engine upgrades available that can be seen through the use of PC mods. They don't affect the top speed at all though unfortunately. They just make it accelerate a little faster, that's all. It's a neat idea though - perhaps they could've done that to start out with. 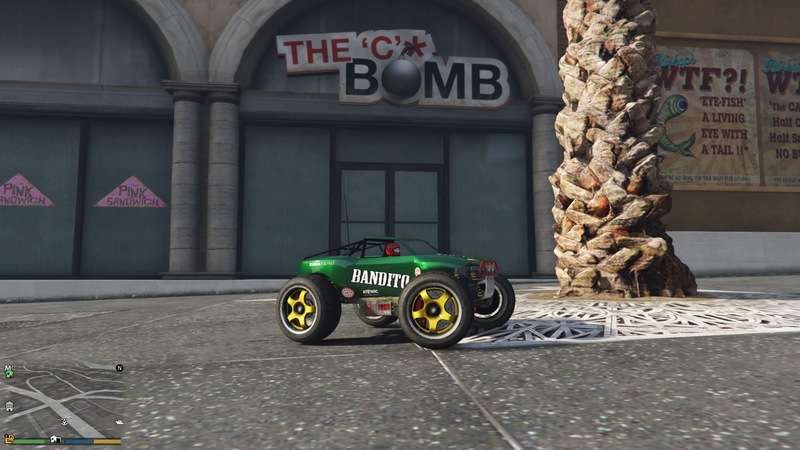 The RC Bandito could've had a 1km range as standard and then you could pay extra to have it travel further. Or decide between stock performance and long range or high performance with a short range, whatever. In a racing enironment, you definitely want to be jumping as much as you can that's for sure (once you've reached top speed at least). Yeah I didn't want to give them ideas about limiting the range, although I thought that's how it would be.. like the battery has run out. If they downgrade this then I won't use it . I was looking through my screenshots and I found this one. I know it's not the same for many reasons and I hadn't even thought of recreating the original shot, but it really reminds me of the original. So now I wanna do it better, gonna black out my Bandito, find a location, right time of day and try to replicate that Olds. This car is great. I only hope they add a plane or helicopter next. A property that lets you launch a Predator-style drone from the comfort of an air conditioned office. Give it a limited supply of missiles, 6 or so, and a kamikaze attack. Make it appear on radar when below 1000' altitude and invisible above that (to keep it fair, the missiles should have a shorter range than this). When at high altitude, let you switch to a "recon mode" that slows it to just above stall speed and gives you a pan & zoom camera to spy on people. This is what the orbital cannon should have been. Lol passive popping facility warping orbital cannon firing KD Warrior accuses someone else of being a KD Warrior. You couldn't make it up. I'm glad there is a new and effective way to make these tryhard losers cry salty delicious tears for my chips. ^^ that was great to watch, I'm in work and missing my Bandito (yes they are that fkin good) and that gave me a quick fix. This is what most people who come across a Bandito must be thinking.... C*nt! And it has a bomb! It is the C Bomb, I use it to destroy tryhard C*nts. Got called a tryhard and no lifer while trolling people with that thing. Didn´t do much killing with that thing, i just jumped into people faces and trolled a bit with the kinetic mines. The kinetic mines destroy cargo in one hit btw. Didn´t knew this before. 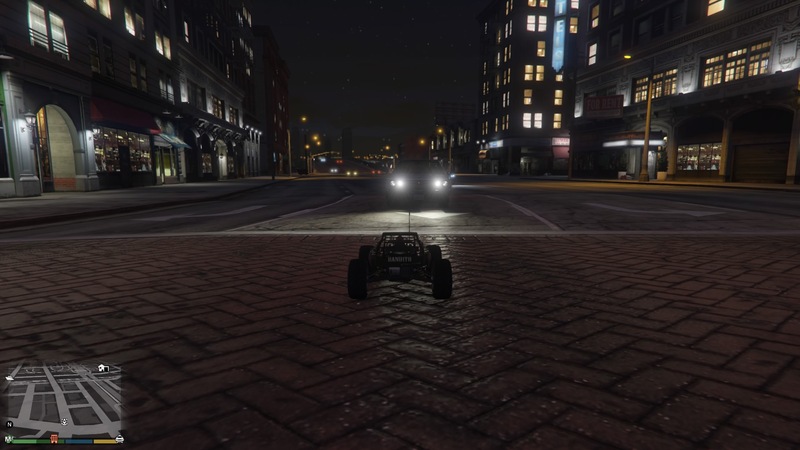 Saw an MKII griefer today chasing someone's I/E vehicle. So I raced over there on my one to distract him, and did circles around him. I only have explosive cannons so I'm not that effective, and quickly got blown up but in the confusion, the griefer blew himself up too lol. I called in the Bandito as soon as I could and raced over to the griefer. Sure enough, he registered as MC and called in his MKII like the unimaginative predictable troll he was. By then it was far too late. Just as he ran up to get on, I was already there and blew it and him up, further delaying his attempts to destroy the I/E vehicle. Once I respawned, the I/E vehicle had been delivered, and the griefer did the next predictable thing and warp to his facility. So I warped to my apartment. Griefer left a few minutes after. I've also been bad with my Bandito. It's a blast to ride around the map! This thing has added life to GTA for us who appreciate it's uses. Made two MKII griefers leave the same lobby today, instantly making the lobby safe for everyone, all thanks to the Bandito! The griefers themselves kept landing thinking they could use their own Banditos, but they kept reverting back to their MKII's and that left them vulnerable. Blew them up far too many times for them to handle when it comes to their precious KD. In between blowing them up, I would warp back to the facility just to set the Strike Team on them, and then warp back to the apartment so I could unleash the Bandito in the city again. I also baited one griefer by getting into my Terrorbyte and as he started to try and attack my Terrorbyte, I blew him up with my little flying drone. One eventually left, and the remaining one I killed a few times more. He ended up going passive, just standing in the street, pondering what to do, whilst I observed from a nearby street as the Bandito. Eventually he came out of Passive, went MC, tried to rush to his newly spawned MKII but... oh dear... he ended up going kabloomey. He left instantly afterwards with a wet and salty controller in his hands. I know I keep going on, but I LOVE THIS THING! It is without a doubt the strongest anti-griefer addition to the game. Out of all the weaponised vehicles there is, including the MKII (which isn't really an effective counter to griefers when they're using one themselves) the Bandito is hands-down the best tool to use. I would recommend it for all players who want to have something at their disposal that they can use to escape situations and provide an effective counter-attack with. This seems to be the way now.. They gonna have to learn not to land on the ground. Stay in the air, MKII fairies. The ground isn't for you anymore! If you come down or are forced down, prepare to have your K/D reduced! K/D? People do know that this is GTA and not CoD right? Are they really that stupid? Yes, they really are that stupid. Exploiting this weakness in them by merely threatening to damage their K/D is what makes them crumble haha. Funny because it has made some Tryhards so paranoid all they literally do is blow themselves up over and over and over and over more than they did before. Or never leave passive mode. There is no point in them types playing the game any more really if they are that scared. Always amazed me that people are scared of thier pixels dying and respawning. I'd rather just not play with idiots who think they are playing CoD in GTA. Oh I don't. I now force them to leave the lobby. No longer am I forced to switch session myself. If I have a spare bit of time, out comes the Bandito to perform a grief-sweep operation. I call them "goth babies" because they wear all black with the black diapers over their mouths which is where the poop comes out of on Tryhards. I too teamed up with another random Bandito and we were circling a griefer who was hiding in a building complex like a pair of sharks lol. I painted mine grey to be harder to spot on the roads and pavement but black is a good shout too. What lid do you have? I have the standard default one. I tell ya everyone, this is one of the best additions to GTAO. Haha brilliant. I wish there was a shark mask! When are they going to make the shark eating a cheeseburger mask on GTA?